Our Local Content Officer will help develop, promote and maximise opportunities for local suppliers, contractors and job-seekers in the regions by connecting to relevant government, industry, businesses, Aboriginal Corporations, employment and training stakeholders. This page contains updates and advice on ongoing opportunities for businesses as part of our local content strategy in the Kimberley region of WA. For further information about Local Content please contact Kimberley Development Commission via email on localcontent@kdc.wa.gov.au or phone Dylan Heath, Local Content Advisor on 08 9194 3004 or Mobile 0438 161 658. On 6 August 2018, the Kimberley Development Commission hosted the 11th WA Industry Link Regional Roadshow in Broome. 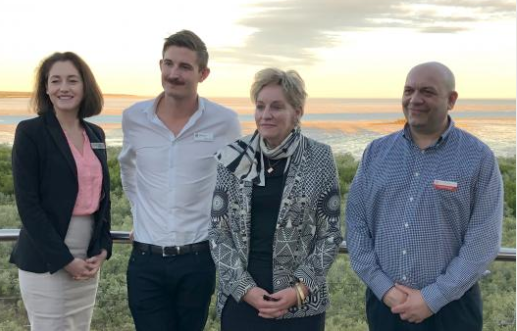 Photo: Land Access Policy Adviser Lisa Campbell, Local Content Adviser for the Kimberley Dylan Heath, Minister Allanah MacTiernan and Jobs, Tourism, Science and Innovation (JTSI) Andrew Griggs. Increase regional businesses’ knowledge, skills and capability to capture regional opportunities as per the Building Local Industry Policy. Develop specific opportunities for regional Aboriginal business in securing government and industry contracts. Engage with lead contractors and suppliers to promote maximum local job-seeker participation. Businesses can either register for full or partial scopes. Businesses wishing to advertise their capabilities for future sub-contractor opportunities should complete the partial scope section and highlight their capabilities.